In large non-stick pan, add cinnamon stick, coriander, paprika, ginger and cayenne pepper. Toast over medium high heat until fragrant, about 30 seconds. Add canola oil, celery and onion and cook 3-5 minutes until vegetables are softened. Stir in garlic. Add chicken broth and chopped tomatoes. Continue to cook uncovered about 8-10 minutes. 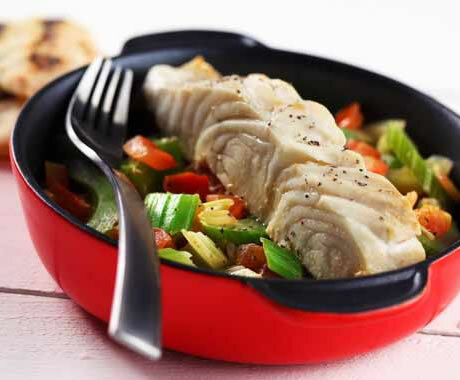 Push halibut fillets into sauce. Reduce heat, cover and simmer gently until fish is just cooked through, about 8 to 10 minutes. Serve with grilled flatbread. Halibut is often called the steak of the fish family due to its thickness and texture. See how this meaty, flaky white fish gets spiced up in sweet and savory ways. Recipe Yield: Yield: 4 servings. Serving Size: 1 halibut fillet with 1 cup vegetables.